It sure feels good to be a Liverpool fan again, doesn’t it? Form cures all. I don’t want to speculate on any specific reason why the Reds have returned to the elite of English football. The fact is that since the mid-December defeat at Old Trafford, Liverpool is playing to a 78.125% winning percentage in all competitions. Yet we are still long-shots to make a return to the Champions League, and that’s just evidence of how deep the grave we dug last fall really is. It doesn’t matter, because the team simply looks great. They are dominating possession, defending well, creating chances and scoring goals again. Finally Brendan Rodgers has us dreaming once again, and it feels fantastic. Now that the January transfer window has closed, talk has shifted from bringing in new players to discussing how we keep our current ones. Specifically I am talking about Raheem Sterling, whose decision to hold out on signing an extension has many fans up in arms. Rumors are that the club has offered around £100K-per-week, which depending on what source you believe would represent about a 100% raise on his current wage rate. 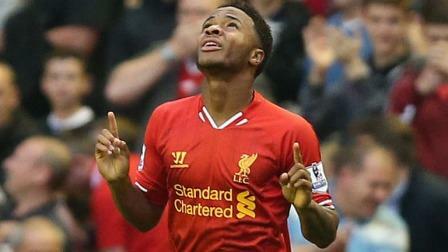 Sterling, whose contract expires in 2017, is supposedly requesting closer to £130K-per-week. When you have a 20-year old talent as one of your best players, the natural inclination is to keep the kid happy and give him what he wants. Is it really that simple? What are the long-term implications? In order to try and understand better, I completed yet another statistical exercise. Side effects of a math degree gone awry, I assure you. Before we get into specifics, I need to clarify a few assumptions of this exercise. Assumption #1 is that the club is currently operating under fiscally sound practices. The published wage bill from 2013-14 was listed at £132-million. Data for the current season is not yet available, but the basis for the first assumption is that the club can reasonably afford to maintain a similar wage structure without adversely impacting the club. Assumption #2 is that they are operating with the ideal number of players in the squad. Liverpool currently have 25 first-team players under contract. In order to maintain competitiveness through four competitions next season, we assume that we need to keep that number static going into 2015-16. If we let a player leave this summer (i.e. Gerrard), then we’ll need to bring in a replacement as well. There are other factors to consider when looking into long-term player contracts. For example we can expect to see increased television revenues now that the league announced a new TV deal has been struck, and certainly matchday income will increase substantially after the club completes the expansion of Anfield before the 2016-17 season kicks off. Those are both going to be positive income generators for LFC, but nearly impossible to quantify how this increase specifically will translate to an increased wage bill. Regardless those revenues won’t realized until 2016 at the earliest. The following data is based on personal research and may not be 100% accurate, but for the purpose of this exercise it should be close enough. I have placed each player on the current squad into one of three categories: contracts expiring in 2015, expiring in 2016, and expiring in 2017 and beyond. Clearly a player whose contract expires in 2015 will either be leaving the club on a free transfer next summer or sign a new short-term deal to stay. Players whose contract expire in 2016 need to be looked at a little more closely to determine whether or not their future lies with Liverpool, and if so they will need to be offered a new deal prior to next season. Lastly players whose contracts expire in 2017 or later need to be less concerned but still attended to if players begin to outplay their wage rate or want to be secured for long-term services. Also it should be noted that I am not considering goalkeepers in this exercise for the simple reason that Simon Mignolet is under contract until 2018, and an eventual replacement for Brad Jones will come this summer and be an insignificant alteration to the overall wage bill. Four players on the current roster have contracts expiring this summer: Steven Gerrard, Kolo Toure, Glen Johnson, and Jon Flanagan. We already know the Gerrard is leaving for MLS this summer, so let’s put his £140K weekly rate into what I am calling the wage redistribution pot (WRP). That’s a good start. Glen Johnson makes £90K-per-week and there have been rumors of a possible extension being offered. While many people think he’s been more of a liability than asset recently, I believe that there is a number out there for which keeping an experienced 30-year old marauding defender has value. I assure you that number is well below £90K, so for now let’s add his wages to the WRP. Jon Flanagan’s season-long injury makes his contract easy to renegotiate. Currently on £40K-per-week, the lack of playing time has severely reduced his leverage and I would expect a modest increase (maybe £45K) to extend his services a few more years. Kolo Toure is a different situation altogether. The soon-to-be-34-year-old defender earns £60K-per-week, and while he’s performed admirably this season, it doesn’t appear likely that the club will offer him a new contract. He simply doesn’t fit the mold of their current target player. Let’s add his wages to the WRP. The net result is £285K in weekly salaries which will need to be redistributed among three new roster spots. Let’s now look at the players with contracts expiring in 2016: Martin Skrtel, Jose Enrique, Jordan Henderson, Javier Manquillo and Rickie Lambert. The obvious decisions in this group are to re-sign Henderson and move Lambert. Henderson currently makes £55K-per-week, but surely the future captain of Liverpool will be locked down with a significant offer. My assumption is that he’ll end up around £75K, just about what Adam Lallana makes. If he could learn how to finish like our current captain, he’d make a lot more. The other easy decision is cut ties with Lambert, who happens to turn 33 years old tomorrow. With the return of Divock Origi and recent resurgence of Mario Balotelli, Rickie becomes 5th choice striker and there’s just not enough room at the inn for him. Javier Manquillo is currently on a two-year loan with an option to buy, so while we may end up exercising that right to purchase his contract outright it’s not a decision to worry about until 2016. Jose Enrique appears to have fallen out of favor as well, and I seriously doubt the club will look to extend his services. If they can ship him out in the summer and free up his £65K weekly bill, then that would be preferable. The club will get very little for a mediocre 29-year old wing back with only a year remaining on his contract. His value as an experienced squad player may be more useful than the few million quid that they could possibly get with his outgoing transfer, so let’s assume he remains a Red next season. That leaves us with Martin Skrtel, the 30-year old Slovakian central defender earning £90K-per-week. While he’s certainly paid as one of the top players in the current squad, I’m sure many people question whether or not the value is there. I’m a big fan of Skrtel, and I’d love to see him remain at Merseyside. Unfortunately I can’t see FSG offering the big guy a new contract this summer. I see this saga playing out much like the Gerrard and Johnson contracts did this season. FSG will want to keep him in 2016-17, but for a reduced rate. I see little chance that his £90K will come off the books this summer. So where does that leave us? Our WRP has now increased to £310K with four players (Gerrard, Toure, Johnson, Lambert) now needing to be replaced. The final group to evaluate is those whose contracts that expire in 2017 and beyond. When you start looking at players with multiple years remaining on their current agreement, you only need to consider younger players that will increase in value over time. The players whose services you need to protect. At 20 years old, Raheem Sterling has the tools to become one of the world’s best players. He’s already one of the best English players in the game. It may be impossible to afford the gargantuan salaries that a club like Real Madrid may eventually offer him, so it’s critical to protect the club’s interests and maximize the transfer fee in the event you do lose his services. This is why the club renegotiated the contract of Luis Suarez last winter, less than a year after he put pen to paper on the existing one. In order for players with existing long-term contracts to be considered for renegotiation, they need to have shown two things: youth and performance. On those criteria I think it’s safe to assume the following players may end up with contract negotiations at some point next season: Sterling (20 years old at £50K), Mamadou Sakho (25 years old at £75K), Alberto Moreno (22 years old at £40K), Lazar Markovic (20 years old at £35K), Emre Can (20 years old at £60K), and Jordan Ibe (19 years old at £30K). Coutinho just inked a new deal last week, so his long-term future is with Liverpool until the end of the decade. For argument’s sake, let’s assume Sterling accepts the large raise currently on the table, and the others get decent £10K offers as well. These overall increases will reduce our WRP significantly to £210K. And we still need to add four more players. Divock Origi will return from his loan spell at Lille and immediately fill one void at about £50K per week. Other possible loan returnees include Andre Wisdom (defender earning £30K) and Joao Teixeira (midfielder earning £30K), but will those players be the impact players coming back that will significantly improve the squad? If Sterling and his agent remain rigid, can the club really afford to give in to his demands for an additional £30K and further deplete the coffers needed to bring in new talent? Is Glen Johnson worth a reduced rate of £60K per week, and would he even accept it? If Wisdom and Teixeira don’t fit into Rodgers’ plan for the future and we give in to Sterling’s demands, it still leaves us needing three more players and only about £45K per player to offer. Remember this fact when you start hearing names like Marcos Reus being tossed about in the transfer rumor mill this summer. There isn’t a lot of room to acquire game-changing talent and maintain your fiscal balance next season. This isn’t an exact science, and there are other variables that could alter the strategy considerably. The team is playing brilliant football finally, winning games at a wonderful pace. The squad makeup is brimming with youth, and there is much to look forward to in the years to come. But the situation is tenuous, and it’s critical that the club continue to make the right financial decisions if we are to continue our upwards trend. Liverpool is alive in three more competitions, with a chance to win two trophies still. The first step on the long road to the Europa League is Thursday afternoon against Besiktas, and then we return with another important league fixture on Sunday at Southampton. The hits just keep on coming! So get on down to the pub and cheer the boys on! I know I will!